“Man. That was a hell of a day on social media” tweeted Hunter Tura, President and CEO of Bruce Mau Design. It was the evening of January 23, 2015, and the Internet had been reverberating with the discovery of a delightful secret about the Toronto-based design firm’s visual identity for Sonos, the home audio company best known for their wireless speakers. Radiating lines emanate from behind the crisp white wordmark in dizzying one-point perspective. Just as your attention drifts from the logo to scroll down the webpage, the amber strands pulse and tremble like sound waves springing from a subwoofer. The logo isn’t animated—the vibrating corona is an optical illusion rendered by screen pixels struggling to paint the logo’s finest lines as you scroll. The meme started with an article on The Verge that has been shared almost 50,000 times. It’s easy to see how the moiré pattern went viral. When you see music pulsating in a static image for the first time, you’ve got to pass it along. AIGA Medalist Bruce Mau founded Bruce Mau Design in Toronto in 1985. At the time, Mau was completing the design of his first book, Zone 1|2: The Contemporary City, a 480-page tome of illustrations and essays by the likes of Peter Eisenman and Rem Koolhaas. Mau and editors Michel Feher and Sanford Kwinter conceived a new model of visual expression in book form: what writer Thomas de Monchaux calls “densely saturated landscapes of color and textured images, landmarked by bold figure-ground moments of typographic punch and void.” The book launched a series of prodigious and prolific relationships with architects, planners and those involved in placemaking and the urban fabric. Subsequent monographs—most famously 1995’s S,M,L,XL (with co-author Koolhaus and weighing in at over five pounds)—cemented Mau’s role as an innovative communication designer and a provocative urban strategist. Through the 1990s and early 2000s, Mau’s influence could be seen across the design landscape: from creative direction of I.D. 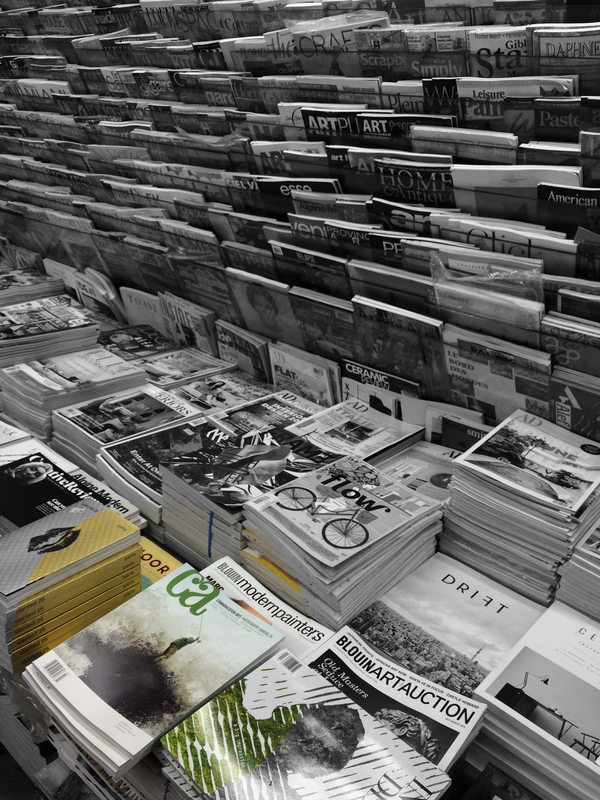 Magazine, to identity and environmental graphics programs for Frank Gehry’s Walt Disney Concert Hall, the Museum of Modern Art, and the Seattle Public Library. In 2010, Mau left the firm in conjunction with its sale to MDC Partners, a publicly-traded holding company based in New York. He had moved to Chicago and published Massive Change, a manifesto in book form proposing bold and visionary ideas for cities and their citizens. Today, Mau and his wife Aiyemobisi Williams lead the Massive Change Network, a consultancy exploring themes of innovation and sustainability on a global scale. As founder and chief creative visionary of his firm, Bruce Mau left a void, one that required Tura and his team to reinvent themselves and their practice. Tura crafted a new organizational model—team-based and highly collaborative, with more responsibilities handed over to the creative directors and team leaders. He began referring to this as the shift from Superman to the Avengers, a league of superheroes from the Marvel Comics universe, and the labels stuck. Today, the studio is composed of five teams: environments, packaging, the Los Angeles studio, and two brand and communications teams. And, just like the Avengers, each team has its own talents, tools, and methods. Tura acts as impresario, matching clients and projects to teams. As one of the Avengers, Laura Stein, whose decade-long tenure as a creative director at BMD spans chapters one and two, believes the transition has been a positive one: “there’s a nice continuity of spirit in the studio while things are always changing—it’s not a static place.” And, as Stein’s team demonstrated with the Sonos identity, not even the logos they design stand still. BMD is the brand agency of record for Sonos, and since 2011 Stein has led the design for the company’s visual identity, along with contributions to package and product design—and even a wrapped subway car in New York and a popup event space in Paris. Stein explains that there isn’t one design process that drives all projects. Instead, “we borrow tools from different disciplines—making paper sculptures to explore a two-dimensional logo for example, or wireframing a book.” This expansive and cross-pollinating approach often results in unexpected design solutions, like the moiré Sonos wordmark. The visual identity that BMD created for Sonos is more of a kit of parts than a traditional hard-lined system. 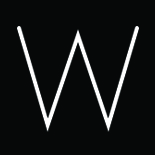 The Sonos brand lexicon encompasses the “amplify” wordmark with its radiating waves and a wallpaper made from the Sonos name cropped and repeated. Instead of defining a standard color palette for the brand, Stein and team introduced the idea of color gradients as the defining theme—vivid transitions from one color to another. This brand language extends to the products themselves, with a new Sonos limited-edition speaker dipped in a wash of dark navy to sky blue. The wide variety of visual expressions of the brand represents the breadth, diversity, and vitality of music itself. The day before the viral explosion of the Sonos logo, the LA studio was abuzz with the public launch of Proper Hotels, a new hotel and residence brand by the founder of Viceroy and Avalon Hotels. Andrew Clark and LA-based associate creative director Ryan Adair are leading the effort to envision and roll out the new brand of luxury hotels that will launch in San Francisco at the end of the year and in Austin in mid-2017. Adair explains that the Proper identity is “rooted in the grand hotels of the past that were emblems of the cities they were in.” And yet, the logo is a modern, playful interpretation of these landmarks, with an awning shading its uppercase letters—“the classic, ever-present welcoming entrance,” says Adair. Forged in bronze like an art deco door handle, the logo is often animated, its awning flapping gently, as on the Proper website. BMD’s brand work for Proper will extend to packaging and on-site amenities like bars and restaurants, along with matchbooks and postcards as a nod to hotels of the past. A key project that tested the breadth of their talents was Met Life Stadium, the Meadowlands, New Jersey sports complex that NFL rivals Giants and Jets both call home. For the opening of the stadium in 2010, BMD collaborated with the Rockwell Group, the architects, and the two teams. “Our role was to design the fan experience—you don’t look that up in the Yellow Pages,” Keogh laughs. “We looked at all the touch points from street to seat to choreograph the experience beyond the action in the bowl at game time.” The result was an integrated system of signage, sponsorship strategies, digital elements, and placemaking, all flexible enough to cheer on the New York Jets one day and the New York Giants the next. Keogh and his team have built upon the experiential quality of the design work for Met Life Stadium in some large residential and retail developments in the US and Canada. When Journal Squared opens in mid-2016, it will feature the tallest residential tower in New Jersey, rising to 70 stories. BMD crafted the development’s name as a nod to neighboring Journal Square and the towers’ geometric facades. The team proceeded with visual identity, brand guidelines, and environmental graphics. Just around the corner from BMD’s Toronto studio is The Well, another mixed-use development branded by the firm. Hunter Tura, who trained as an architect at Harvard University’s Graduate School of Design and worked in the office of AMO/Rem Koolhaas, believes urban design has shifted from an architect’s singular expression to the collaborative output of designers like those in his studio. He explains, “Municipalities now think like brands and branding has displaced the public’s appetite for planning in the traditional sense.” If there is a sense of coherence about a place, it is achieved through many means: from branding and signage to digital media and placemaking. As Bruce Mau Design makes the transition from Superman to the Avengers, Tura sees an analogous shift in the role of the designer from author to editor. “It is our responsibility as designers in the 21st century to think like editors because we need to create work that is more efficient, of higher quality, and ultimately more sustainable. The mantra of the late 20th century—‘Less is More’—was a choice” toward minimalism and simplicity, Tura explains. “In my view, we don’t have that choice any more. We have to think editorially,” embracing constraints and cutting the non-essential. As an example of an editorially-driven design solution, Tura points to BMD’s “Know Canada” campaign of 2012, which answered a challenge by the WNYC radio show Studio 360 to “redesign Canada” with the hope of educating its neighbors to the south beyond the tired clichés. Designers at BMD began with the most emblematic image of Canada: its flag. Tura adds, “we took the maple leaf out and filled it with all the vitality and innovation of the country.” In a video, posters, and even an app, the iconic red bars now frame the many faces of contemporary Canada. Published in Communication Arts, July-August 2015. P.S. 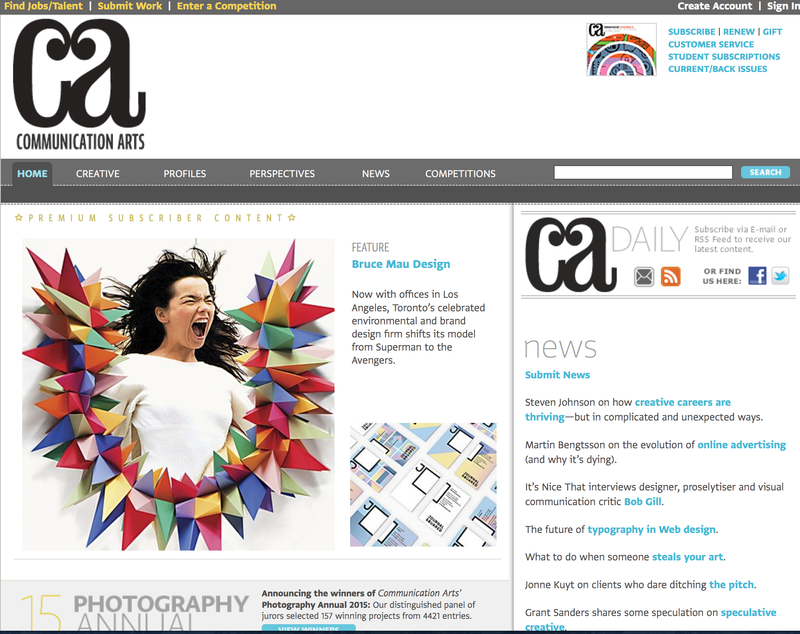 It was a thrill to see this feature on the CA home page and on the newsstand!